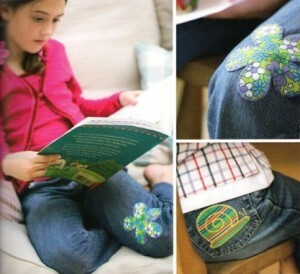 Patches are a great way t0 get into recycling and reusing fabrics in fresh and inspiring ways. 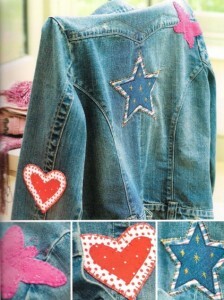 You can make patches to use up your old scraps or remnants of fabric rather than just throwing them away; you can also use them to liven up or repair worn clothing,accessories or furnishings. Parches also make fabulous little presents – they’re easy to slip into a card! This is a great starter project that would also be ideal for an adult and child to tackle together: kids will love customizing their clothes or school bags with these patches. We have chosen an ever-popular heart motif for our patch. Appliqué is the technique of applying fabric shapes to a background fabric to create surface decoration. There are a number of appliqué methods; our preferred method is machine appliqué using a fusible webbing to apply the design, which is then finished with a machine zigzag stitch. If the patch is going to be practical, for example to cover up a worn-out area on the knees of jeans, you will need to use durable fabric such as denim, canvas or corduroy. We used two medium-weight cottons, with scarlet and white polka-dot patterns for visual impact. If the patch is going to be purely decorative, you could use more delicate fabric, such as printed cotton lawn, silk doupion or velvet. 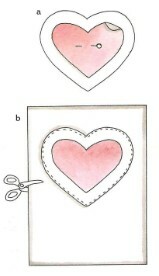 Draw two heart-shaped templates (one smaller, one larger} onto a piece of pattern paper. Cut the tern plates Out and trace around them with a pencil onto the smooth side of the fusible webbing. Cut roughly round the shape, leaving a margin of about 5mm (1/4’’} outside the pencil line. Take the two pieces of fabric you are using for the patch. Place the larger shape pencil-side up onto the wrong side of your first fabric in a poison that gives you the best pattern coverage, Cover with a pressing doth to protect your iron from any glue residue . using the medium setting. press (fuse) for about 15 seconds until the shape is secure. Repeat with the second, smaller shape. Cut out both heart shapes along the pencil lines. Peel the paper backing off the large heart, place it onto the piece of felt and fuse. Next, set your sewing machine the standard straight stitch and. starting at the top middle point, stitch around the large heart. 2mm (1/4) from the outer edge. Then, using sharp scissors, trim back the felt to the fabric edge (b). Now set your sewing machine to zigzag for appliqué stitching and zigzag around the edge of your shape Choosing an embroidery thread that picks up a color within your design (we used white to stand out against the scarlet, blanket stitch around the smaller heart (see post on this page). These patches make wonderfully vibrant and colorful additions to children’s clothing. If you don’t want to use a sewing machine to make the patch, simply follow steps 1-3, neaten the edges with blanket stitch or pinking shears and sew the patch in place using running stitch. We’ve suggested using motifs of a snail, a star, a butterfly and a flower. So we finished this project off by carefully pinning the patch to a pocket and then sewing it in place using a large decorative overstitch, you could use a large Embroidery stitch or, if the patch is in an area that is easily accessible using your sewing machine, you could machine stitch it in place.